French for pancakes, crepes belong to the longstanding culinary family that includes a variety of flat breads cooked on a griddle. 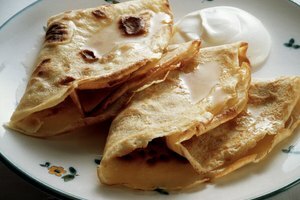 In the U.S., cousins and siblings of crepes include flapjacks, hotcakes and cornmeal Johnnycakes; they go by an assortment of names in other countries. 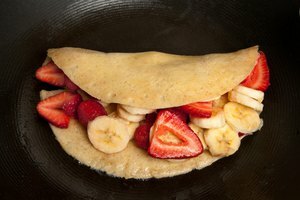 Crepes contain far less flour than typical pancakes; the batter is thin, cooks quickly and makes paper-thin pancakes. Although the pancakes of the past were not the crepes of modern times, combinations of flour, eggs and milk cooked on a griddle appeared in ancient Rome. In medieval Europe, crepes and pancakes became popular on Shrove Tuesday, the day before the Christian Lenten season begins, because Christians needed to empty their houses of eggs and fats as part of the fasting that occurred before Easter. In Italy, crepes go by the name crespelle, in India they're dosa, and in Mexico they're called tortilla. Follow the lead of French aficionados of crepes and smother them in chocolate-hazelnut spread for breakfast or fill them with leftovers for a dinner entree. Or cook crepes like Brittanians in northern France and make buckwheat crepes, called galettes. Try your hand at crepes Suzettes, drenched in orange juice and two orange-flavored liquors and set on fire just before serving. Legend has it that these crepes were set aflame accidentally in a French restaurant just before they were set down as dessert before the Prince of Wales in 1894. The prince liked the sauce so much that he asked that the dish be named after a young girl in his retinue. Use a blender to make a smooth crepe batter. 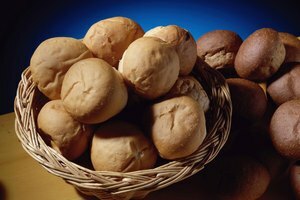 Typical batters have a ratio of 2 large eggs and 3/4 cup milk for each cup of flour. Dessert crepes also contain a few tablespoons of sugar. 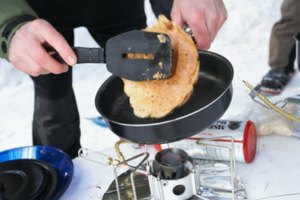 Crepes are notoriously tricky to cook, needing just the right degree of high heat; just the right size, non-stick pan; and speed in swirling the thin dough around the pan. 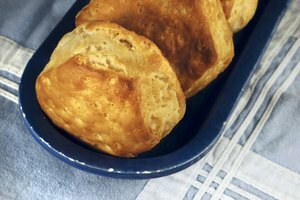 Jacques Pepin, noted chef and co-author of Julia and Jacques Cooking at Home, recommends that you pour the batter into the side, not the center, of the pan, so it spreads rapidly all at once. Julia Child suggests adding more batter to the pan than your recipe calls for and then pouring out the excess batter. Cook the butter in your crepe pan until it browns slightly, about 2 to 3 minutes, to give the crepes a nutty taste. Home cooks around the world fill crepes with both savory and sweet fillings. For dessert or for breakfast, use sweetened, cooked fruit, such as apple, banana or pear slices cooked with butter, honey and cinnamon; a smear of peanut butter; or a sprinkle of powdered sugar and a squeeze of lemon juice. For dinner, spoon in mushrooms in a goat cheese sauce, shredded pork or chicken in a white sauce, scrambled eggs with or without cheese, or sauteed vegetables.